Saturday, June 6–On yet another bright and sunny morning in Bangalore, the day of our highly anticipated trip to Bannerghatta National Park, the team gathered in the hotel lobby to wait for our favorite driver, Ganga. As we sped through the streets of Bangalore—it was 8 a.m., and the day’s traffic jams hadn’t yet begun—we passed through neighborhoods slowly beginning to awaken. Women in sarees of every hue carried baskets of fruit on their hips and heads to sell on the side of the road, and street vendors began putting out their trinkets and stock. Men swept the streets with bundles of dry coconut branches that work as a broom (this seems to be the traditional method of sweeping in India) in preparation for the start of a new day. We passed shantytowns and slums where the economic divide was evident in the dilapidated buildings and the men sleeping on the side of the road. As we pulled into Bannerghatta Park, the team left the bus, excited to see the elephants that almost everyone al we had encountered all week had talked about. This was of particular interest to me because the photographs and interviews with people in villages surrounding the park would add to my story about elephant-human conflict in the region. Stalls were just opening as merchants brought food, set up machinery such as the sugar cane juicer, which reaps the most marvelous, sweet-tasting, cool nectar for only 100 rupees a cup, and laid out colorful toys and stuffed animals to entice visitors. Professor Selvin bought our tickets, and 45 minutes later, we loaded the bus that would take us on our safari adventure. The bus jetted through the high green metal gates that allowed entrance into the safari zone and careened through narrow, winding roads on rough terrain. The driver took the turns sharply and quickly, making the potentially dangerous ride undeniably fun and exhilarating for everyone, and reminiscent of a roller coaster ride. It was unlike any American safari I had ever been on. The driver gave no warnings about wearing seat belts or abiding by any other precautions. He allowed us to get up and press ourselves to the windows to get better shots of the animals. He sped down the bumpy hills and through the forest areas so fast, all while juggling his cell phone between his shoulder and ear, leaving only one hand on the steering wheel and never reducing speed. The animals were glorious. Spotted deer in huge herds fed off the grasses. Vegetarian sloth bears ambled across the potholed roads. 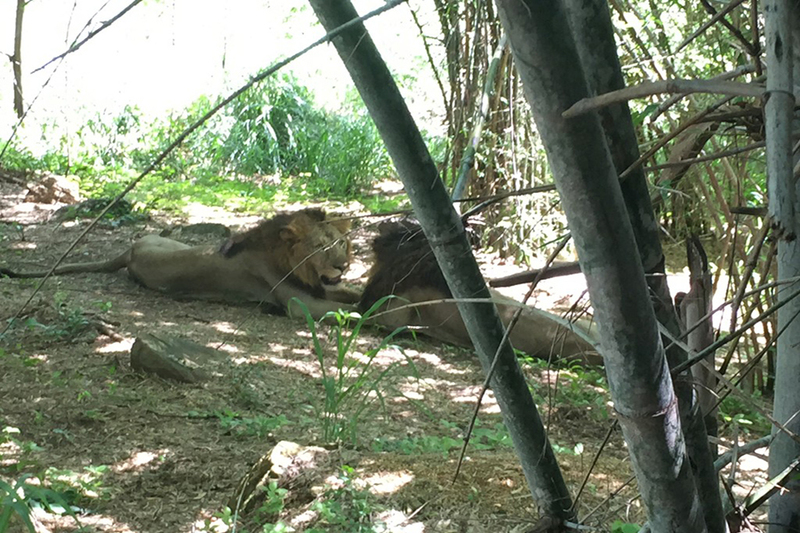 White tigers and Bengal tigers stalked for food, and lions, lounging leisurely together in the grass, were just a few yards from our bus. The driver beckoned for our cameras and took photos for us from his better vantage point. After 30 minutes of animal watching, our tour ended. We strolled through the park’s butterfly garden, where common castors, red pierrots, blue tigers and more flitted among beautiful flowers and trees. But disappointment clouded my mood when the park authorities informed me that my plan to talk to villagers about their problems with freely roaming elephants that dwell on the outskirts of the park wouldn’t work. Though the villages were only 4 kilometers away, the rangers said, they are deep in the forest. They would not have been easily accessible for our team, nor would it have been safe for us to enter dangerous terrain without an expert to guide us. I had to abandon those sources, and we set off for home. This entry was posted in Blog and tagged Bangalore, Bannerghatta, elephants, JWWIndia. Bookmark the permalink.